Thursday February 5th 1920 Wrote Aunt Sarah and Hattie in forenoon. I went over to Emma Spence after dinner and we were down town and through the stores some. Back to Alice before supper. We spent the evening visiting. A letter from Sue McCollister Friday February 6th 1920 Wrote Sue about stopping in St Louis. Alice and I were down town in afternoon. She did errands. I said good by to George in his store. Did fancy work in evening. Saturday February 7th 1920 Charlie Corwine was here for dinner. After he left I packed my suit case. The taxi came for me at 3.15. Alice went to the station with me. A comfortable ride to Springfield. Arrived at 7.25 PM. I had a taxi take me to Charlie Moons. The supper was waiting. 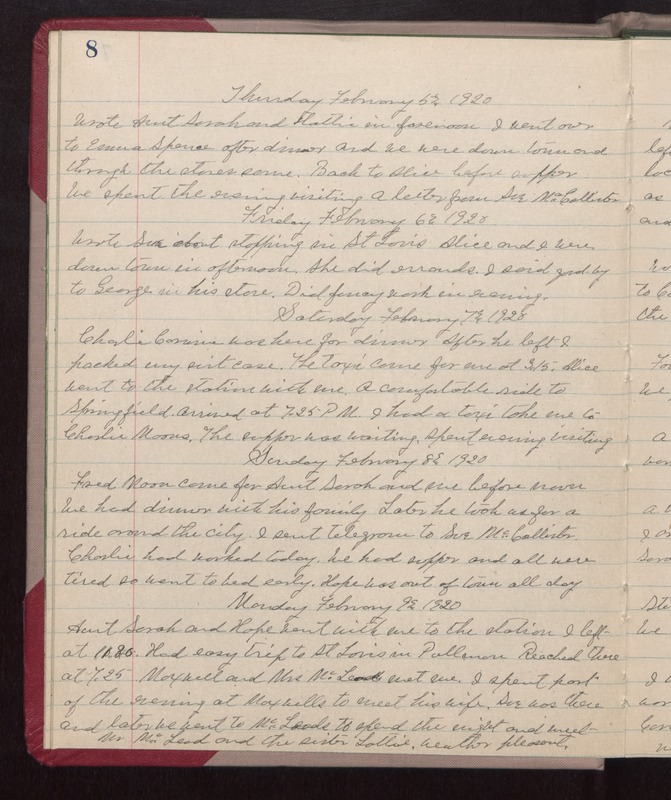 Spent evening visiting Sunday February 8th 1920 Fred Moon came for Aunt Sarah and me before noon. We had dinner with his family Later he took us for a ride around the city. I sent telegram to Sue McCoallister. Charlie had worked today. We had supper and all were tired so went to bed early Hope was out of town all day Monday February 9th 1920 Aunt Sarah and Hope went with me to the station. I left at 11.30. Had easy trip to St Louis in Pullman. Reached there at 7.25 Maxwell and Mrs McLeod met me. I spent part of the evening at Maxwells to meet his wife. Sue was there and later we went to McLeods to spend the night and and meet Mr McLeod and the sister Lottie. Weather pleasant.